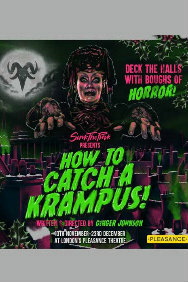 Deck the halls with boughs of horror! International drag collective Sink the Pink are excited to present a dark and terrifying twist on the traditional Christmas theatre show this winter. Inspired by London's bawdy and dangerous theatrical past and a love of classic British Horror - think Sweeney Todd meets the Wicker Man (and Black Mirror with better wigs!) - How To Catch A Krampus is a raucous anthology of terrifying stories and spooked-out songs that come climbing out of the winter dark to remind us that not everyone is good for goodness' sake.... Featuring: ● Dancing drag queens! ● Terrifying live score! ● Show-stopping numbers! ● Mind bending magic! ● Bogey men, blood, and brussel sprouts! A black-hearted antidote to all things cheery this festive season... Guaranteed to ruin your Christmas and enough to put you off your eggnog! “Brilliant, bizarre and completely unmissable...” ★★★★★ - Time Out on previous show ‘Down The Rabbit Hole’ Presented by Sink The Pink and Pleasance Theatre.